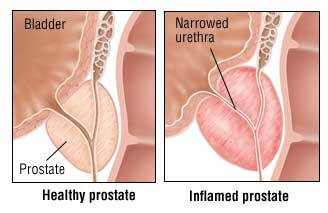 Prostatitis is inflammation of the prostate and often the area around it. There are several causes. The most common is chronic pelvic pain syndrome (also known as prostatodynia). It is so common, we have given it a separate page all to itself. The inflamed prostate squeezes the urethra causing problems with urination. Less common are bacterial infections. These infections are basically just severe urinary tract infections but are often accompanied by fever. They are usually caused by the same bacteria that cause bladder infections, including E. coli, Kiebsiella and Proteus. The infection causes inflammation of the prostate, squeezing the urethra where it passes through the prostate. Sometimes the condition comes on quickly and severely. We call this Acute Bacterial Prostatitis. In other cases, the condition develops slowly over time. This is called Chronic Bacterial Prostatitis. Management will include a full urological assessment to exclude a predisposing cause for this condition, including evidence of bladder outflow obstruction from your prostate. Sometimes long term antibiotics are required.